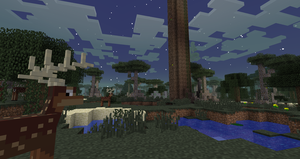 The Twilight Forest contains numerous biomes, each of which contain different plants, generated structures, challenges and so forth. This is the archetypal Twilight Forest biome and makes up most of the Twilight Forest realm. The canopy of leaves stretches far overhead with thick tree growth of both vanilla trees and tall Twilight Forest trees. Twilight Oaks with 5m wide hollow trunks sometimes stretch to the cloud level, allowing the player to view the scenic vista by climbing the vines that line the inside. On the ground, woodland creatures can be found as well as ferns, tall grass, and mushrooms due to the twilit nature of the forest. 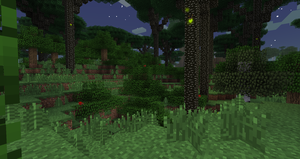 The Dense Twilight Forest is like the Twilight Forest Biome but with more trees and other vegetation. Dense Twilight Forest also contains bushes and other forms of ground cover that make it difficult to navigate. Ferns are scattered all over the ground and outnumber the tall grass. This biome also has more hills and elevation differentials than the regular Twilight Forest. The Twilight Forest Swamp is a cohesive land mass with lakes, Oak and Mangrove trees scattered throughout the swamp. Lakes contain sand or clay at the bottom. The Swamp may be dangerous. The particle effect things takes place in locked biomes, swamps cause extreme hunger and a quick death. Be careful and read the wiki for update news in gameplay. The Swamp is one of two locations where the Hydra Lair can spawn, the other being the Fire Swamp. One of the rarer biomes, the Fire Swamp has lava pools and both the foliage and grass is rusty red. The ground is interspersed with Fire Jet and Smoking Block that sometimes erupt with fire and smoke, respectively. A Fire Jet can light a tree on fire and potentially burn down the swamp. At first glance, these look identical to grass blocks, but a marking which appears to be a grey palette swap of a Naga Scale sprite appears on top. The Hydra Lair spawns in this biome, if it covers one of the landmark grid locations . The Highlands biome's scenery is typical, as only vanilla trees spawn here. Wells and Ruins landmarks are most often found in this biome. Exposed Stone and Coal Ore can be seen here and there. Major landmarks are rarely found. 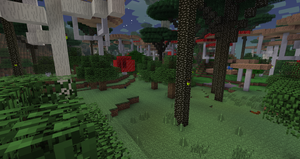 The Mushroom Forest  is basically the Twilight Forest biome with gigantic mushrooms added. Mushroom trees also occasionally replace the usual canopy trees. Giant Mushrooms can also be found occasionally. 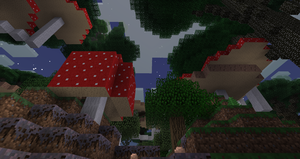 The Deep Mushroom Forest can occasionally be found deep within the Mushroom Forest biome. Mushrooms of all sorts are more common here than any other biome, even the Mushroom Forest biome. Patches of Mycelium replace the grass in places, making this an easy method of acquiring Mycelium, if there is none to be found in the Overworld or through other methods. The Clearing is a flat, grassy area of the Twilight Forest with no trees, lots of tall grass and flowers, and a very flat terrain type. The Labyrinth can only be found in this biome, as there is no room in the Forest to accommodate a Labyrinth. Fewer caves spawn here to make room for the Labyrinth's immense size, but caves can still spawn and intersect a Labyrinth. Trees don't spawn in the Clearing Border neither. If a set of coordinates both divisible by 256 are present in a Clearing or a Clearing Border, then a Labyrinth will always spawn . 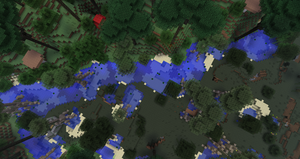 The Clearing Border is a smaller area that is found surrounding the Clearing biome in the Forest. It acts somewhat as a buffer to phase out the immense quantity of trees that spawn in the Twilight Forest to make room for a large clearing in which a Labyrinth can spawn. The Lake is a large, deep lake, almost like a miniature ocean. Due to the Twilight Forest's land-locked nature, it is the closest thing to an ocean that the Twilight Forest has to offer. It is approximately as deep as the ocean. A future version of the mod may allow for islands to spawn in the lake. It is currently a mystery as to what these islands will contain. The Lake Border biome slopes the terrain upwards from the Lake's depths to transition over to other biomes. The Dark Forest stays in complete and total darkness, due to the Darkwood Leaves that create a low canopy above the forest floor. There is not much room to navigate, as the land is punctuated by tree trunks and there are only 4-5 blocks, at most, of vertical space to move about in. 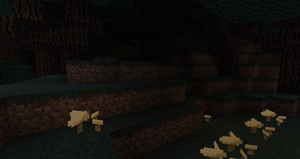 The Dark Forest is occasionally lit by mushroom blocks that provide a minimal amount of light. No lava or water pools can be found below the leaves, as all normal terrain generation features are pushed above the canopy and end up on top of the Darkwood Leaves (except the Hollow Hill, which remains under the canopy). It is nearly impossible to get any daylight in a Dark Forest, as Darkwood Leaves take about as long to break as Stone with a Wooden Pickaxe even when using a high-tier pickaxe such as an Advanced Diamond Drill. 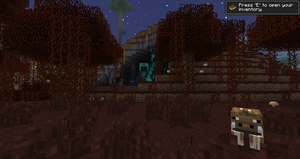 The leaves are immune to both fire and lava, possibly because of the lag that a fire would cause in such a large biome or more likely because of the intended nature of the biome to be a hostile and frightening realm where strange monsters spawn. A Wrath Igniter could be used to clear areas. Doing so takes 9 diamonds to get started, but the resulting amount of Wrath Igniters is more than sufficient to level off the whole biome. 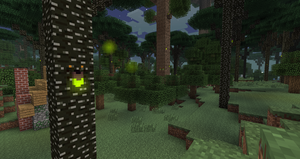 The Dark Forest has two exclusive mobs: the Mist Wolf and King Spider that only spawn inside that biome, each of which have specific abilities tailored to the area in which it spawns: the Mist Wolf disappears when under Darkwood Leaves, and the King Spider has twice the size and strength of the Spider. The Enchanted Forest is a rare and wonderful find. It is notable for its ever-changing foliage hues, which cycle between several shades of blue, green and a combination of the two. Vanilla trees spawn here in lieu of canopy trees, which can still be found but in far fewer numbers. The Enchanted Forest is the only biome where it is possible to find the Quest Grove containing the Questing Ram. It offers the potential to receive one of each color of wool needed to feed the Ram, a potentially very powerful gift for starting players or a good booster for players that have progressed far. If an Enchanted Forest is found, a Quest Grove will always be present . 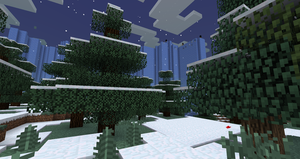 The Snowy Forest is a snow covered winter biome. Spruce trees are abundant and Oak trees have a chance to spawn. The Snowy Forest is always found surrounding a Glacier biome. The Glacier is a frozen wasteland, a gigantic slab of ice that is several hundred meters wide and long and several dozen meters tall. 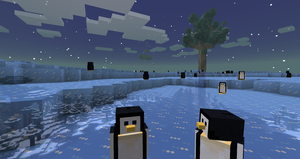 Colonies of Penguins can be found on top of the Glacier. The Aurora Palace is within this biome, home of the infamous Snow Queen . This section refers to numerous biomes deemed "technical" in that they serve not so much a biome purpose as an intrinsic purpose within the mod code related to generation, bordering of other biomes and so forth. More often than not, the Twilight Stream serves as a border between two or more biomes and can be seen as such on a Magic Map. No special items, blocks or events spawn or occur here. More lilypads appear on Twilight Streams than vanilla Rivers. The Major Feature Biome is a biome which always has an area of 1 square meter and is found at every pair of coordinates where both coordinates are divisible by 256, such as (512, 1024), (2560, 1280) or (0, 0). The Major Feature biome controls the spawning of Major Landmarks. Each Major Landmark is tied to a Major Feature biome, which defines the fact that Major Landmarks spawn on a grid pattern with a distance between landmarks on the cardinal axis of 256 meters. This biome is used only for the generation of Major Landmarks in the game code and serves no in-game purpose. 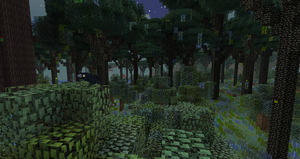 The Minor Feature biome is a biome which also has an area of 1 square meter and is found randomly throughout the forest. It is tied to all minor features, such as Wells, Druid Houses. 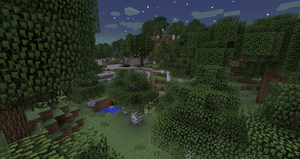 It controls or has an effect on the spawning of Minor Landmarks, the location of which (and the location of these biomes) is most likely determined by the world's Seed as is the terrain features of the Forest. This biome is used only for the generation of landmarks and serves no other in-game purpose. 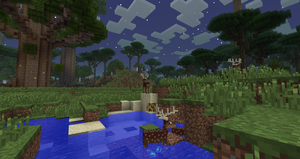 ↑ 1.0 1.1 1.2 See Twilight Forest Landmarks or Generation for more information. ↑ The Mushroom Forest biome displays as Mushrooms or Lots of Mushrooms on the Debug Screen (F3), depending on mushroom quantity and size. This page was last modified on 14 February 2019, at 18:58.